The safety of Uber passengers has been subject to distrust due to several incidents of assault by drivers in the past few years, with sexual crimes being topping the list. Within 2018 itself, there have been reported at least three cases from the US and England. But, as Uber moves forward to turn its fortune around under the leadership of new CEO Dara Khosrowshahi, it is taking steps to ensure that users feel in-charge of their own security. 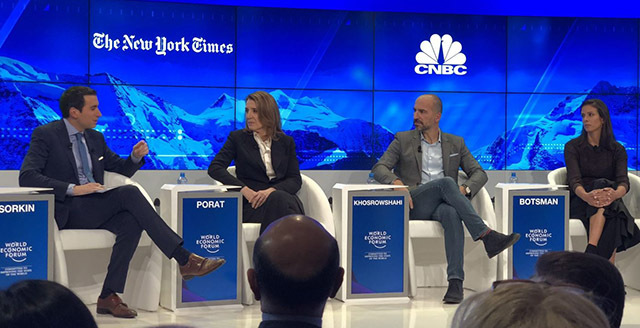 Khosrowshahi, who was speaking at the Davos World Economic Forum (WEF), committed Uber to “truly stand for safety” and announced that it the company is developing a new mechanism to improve the experience of riders. The new mechanism will allow passengers to be able to “opt-in” for not just a bigger or a more premium cab, but also seek drivers with better ratings. This is in line with the executive’s plans to turn Uber profitable by the end of 2021. The company is also looking to make aggressive changes to its functioning and, in the words of the CEO, wants “particularly good” drivers and will these ratings will now be among the strict parameters for performance appraisal. The executive, however, did not speak about the potential financial implications this rating system will have on drivers and especially riders. While it’s safe to presume that like upgrading to nicer cars, riders might have to pay more to ferry with ‘safer drivers’. But, it is very difficult, as of now, to assert whether ratings will determine the fare. It must be noted that Uber also allows drivers to rate passengers and lets them reject a passenger with a bad score. The announcement also coincides with the anticipated Softbank investment which was concluded last week. Uber is currently roiling in losses and is preparing to bounce back by heaping more engagement from its riders.